Free and unique MG-ATR EA – created exclusively for you! We know that such styles as GRID and Martingale are pretty popular even though they are very risky. But what if we take the best things from these strategies and add few safe options inside, allow to make backtests etc. Just to allow you to find own way, the best way for you?! Style 1: as soon as EA places an order, but price goes in opposite direction for “StepOrders” Pips, MG-ATR place 2nd order in same direction. It will place as much orders as you set in “MaxOrders”. If “LotX” will be 1.0 – than it will be kind of GRID strategy. Each new order will be with same lot size as first one. Style 2: it’s almost same to 1st style, just one difference – you can set “LotX” parameter to increase lot size for next orders. Here is an example: if you put “LotX” as 2.0, next orders will be with higher lot size. If you take 0.1 for buy order, but price goes in opposite direction for “StepOrders” Pips, MG-ATR place 2nd order in same direction as you did. Just with 0.2 lot size. The 3rd order will be with 0.4 lot size etc. It will place as much orders as you set in “MaxOrders”. This way is quite similar to Martingale strategy. Backtesting: you may easy find optimal settings for your needs. Just make some tests. 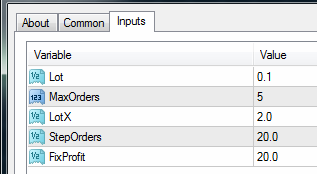 Stop Loss & Exit: if you use “MaxOrders” as 5 for example and “StepOrders” as 20 – than, once you get all 5 orders with 20 Pips distance between them… if price drop for another 20 Pips (there is no 6 order) – than all orders will be closed. Always keep internet connection, otherwise you may get orders without SL. Take Profit & Exit: exit will be by summary Pips from all open orders. For example, if you have “FixProfit” 20 Pips – than once you get +20 Pips from all open orders – all orders will be closed.